The men were not told they had syphilis; they were not warned about what the disease might do to them; and, with the exception of a smattering of medication during the first few months, they were not given health care. Instead of the powerful drugs they required, they were given aspirin for their aches and pains. Health officials systematically deceived the men into believing they were patients in a government study of "bad blood," a catch-all phrase black sharecroppers used to describe a host of illnesses. At the end of this 40 year deathwatch, more than 100 men had died from syphilis or related complications. "Bad Blood" provides compelling answers to the question of how such a tragedy could have been allowed to occur. Tracing the evolution of medical ethics and the nature of decision making in bureaucracies, Jones attempted to show that the Tuskegee Study was not, in fact, an aberration, but a logical outgrowth of race relations and medical practice in the United States. Now, in this revised edition of "Bad Blood," Jones traces the tragic consequences of the Tuskegee Study over the last decade. A new introduction explains why the Tuskegee Study has become a symbol of black oppression and a metaphor for medical neglect, inspiring a prize-winning play, a Nova special, and a motion picture. 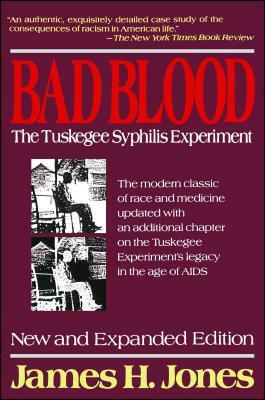 A new concluding chapter shows how the black community's wide-spread anger and distrust caused by the Tuskegee Study has hampered efforts by health officials to combat AIDS in the black community. "Bad Blood" was nominated for the Pulitzer Prize and was one of the "N.Y. Times" 12 best books of the year. James H. Jones is associate professor of history at the University of Houston. He lives in Houston, Texas. He received his Ph.D. in history from Indiana University and has held a Kennedy Fellowship in Bioethics at Harvard University, served as a senior research fellow at the Kennedy Institute of Ethics at Georgetown University, and recently held senior fellowships from both the National Endowment for the Humanities and the Rockefeller Foundation. He published the first edition of Bad Blood in 1981 to critical acclaim. It was a Main Selection of the History Book Club and a New York Times Best Books of 1981 and has inspired a play, a PBS Nova special, and a motion picture. As an authentic, exquisitely detailed case study of the consequences of racism in American life, this book should be read by everyone who worries about the racial meanings of government policy and social practice in the United States. This is a valuable, superbly researched, fair-minded, profoundly troubling, and clearly written book. Bad Blood is an important book, an authentic and appalling study of how the educated deliberately deceived and betrayed the uneducated in our own times through a government agency." Bad Blood is a shocking and bold report of scientific cruelty and moral idiocy...The moral and ethical questions this book raises come into sharp focus and are compelling. By eschewing sensationalism, Jones offers a compelling narrative that enhances our understanding of race relations in the twentieth-century South, of professionalism in medicine, and of American liberalism. Bad Blood deserves to win a prize.